Attorney General, the Honourable Vincent Byron, while addressing a question posed during the Prime Minister’s press conference on Wednesday (January 16), reminded the nation of the serious implications surrounding the outcome of the diplomatic passport case brought against Leader of the Opposition, Dr. Denzil Douglas. The Attorney General stated that in accordance with Section 28 and Section 31 (3) of the Constitution of St. Christopher and Nevis, the Opposition Leader, who is the Parliamentary Representative for Constituency Six, stands to be disbarred from the National Assembly if the court concludes that the use of his diplomatic passport issued by the Commonwealth of Dominica constitutes an act of adherence to a foreign power. The Government’s case is based on the precedent set by the House of Lords in the case of Joyce vs the DPP. The 1945 case of William Joyce—an American citizen with a British passport, who was found guilty of treason against Britain. In that matter, the prosecution argued that the British passport, which Mr. Joyce had renewed immediately prior to fleeing from Britain and which was valid until July 2, 1940, entitled him to the protection afforded to all British passport holders, and that he therefore owed allegiance in return. Following the presentations of three legal expert witnesses on Dominican law in the High Court on Thursday, January 10, 2019, both sides have until January 25 to submit written submissions. Each party will then have until February 4 to respond, if necessary, to those submissions before a judgement is passed down. 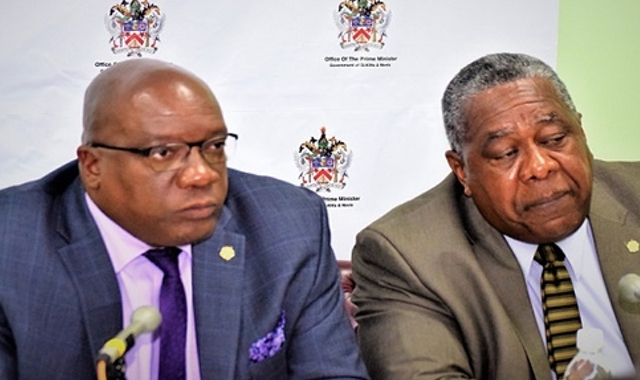 The Dr. the Honourable Timothy Harris led-Team Unity Administration has long accused Dr. Douglas of acting in support of the Commonwealth of Dominica, particularly as it relates to the promotion of that country’s Citizenship by Investment Programme. Prime Minister Harris has reported in the National Assembly that Dr. Douglas has travelled regularly to Dubai where he has promoted the interest of Dominica’s CBI programme in lieu of St. Kitts and Nevis’ own platinum branded programme. Shortly after the introduction of the Hurricane Relief Fund, St. Kitts and Nevis was recognized internationally for offering the World’s Most Innovative Investment Immigration Programme at the 2017 Russian Global Citizen Awards ceremony held in Moscow. Photo: Prime Minister Dr. Timothy Harris (L) and Attorney General Vincent Byron.